When one incoming call to an extension that belongs to a ringing group, the others belongs to the same ringing group will ringing at the same time. When one picks up the incoming call, the others will be released. Only when all ones reject the call, MSS will reject the incoming call. If the caller party is in the same RG, only the target called user will ringing. 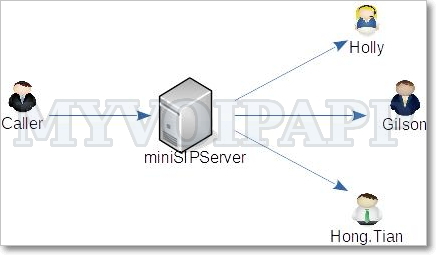 Following figure describes the basic elements in this service. Holly, G.T and Hongtian are in the same RG. When caller party makes an incoming call to G.T, Holly and Hongtian will ringing at the same time. If Hongtian picks up the call, the others, G.T and Hongtian, will be released. Then, caller party will talk to Hongtian. In another way, if Holly calls G.T, Hongtian will not ring since they are all in the same RG. It is very easy to deploy RG feature. What you should do is just update local users' information. Click menu "Data / Local users / Supplementary services" to show and edit local user informations. 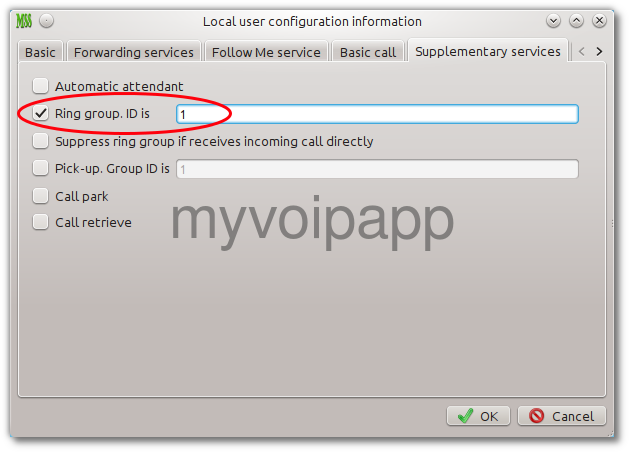 If "Ring group" is selected and ID is valid, then current user will be set in a RG group. All user with the same RG ID belong to the same RG. If "Ring group" is unselected, the RG ID will be cleared together, then this user will be removed from the original RG group.